Cashews are the seeds of the cashew tree, Anacardium occidentale, native to Brazil. The seeds are often mistakenly classified as nuts, and most cooks treat cashews like nuts, especially since they behave like nuts in the kitchen. For people with allergy issues, the distinction between nut and seed can be very important, as some people who are allergic to nuts are not allergic to cashews. The above data about cashews nutritional value is a good indicator why these kidney shaped seeds should be included in the diet plan. Cashews work as great health boosters and a good source of monounsaturated fats and proteins. Moreover, cashews are loaded with vitamins and minerals, which is also another reason for consuming them. Let us take a closer look at the cashews health benefits to understand how beneficial they are. Heart Health: Around 75% of the fat present in cashews are unsaturated fatty acids, moreover, 75% of this unsaturated fat is the monounsaturated fat: oleic acid. Studies reveal that oleic acid promotes heart health, thereby keeping cardiovascular diseases at bay. Diabetes: Several studies reveal that when monounsaturated fat is added to a low-fat diet, it helps reduce high triglyceride levels. Triglyceride is the fat form in which fats are carried in the blood, thus, high triglyceride levels are known to increase the chances of heart diseases. Consuming a diet with some monounsaturated fats is good for people with diabetes. Gallstones Prevention: A study done on 80,000 women by the Nurses' Health Study reveals that women who ate about 1 ounce of nuts a day had 25% lower risk of developing gallstones. Weight Control: Often people shun away from eating cashews due to fear of weight gain. However, a study conducted and published in the journal 'Obesity', reveals that people consuming nuts at least 2 times a week are less likely to gain weight. Besides cashews have zero cholesterol content. Dental Care: Cashews destroy the bacteria responsible for tooth decay, gum diseases, etc. and thus it helps the process of dental care and maintaining healthy teeth. Antioxidants: The antioxidants present in the body help eliminate all free radicals that destroy cell membranes and act as free radical scavengers. Free radicals are harmful, as they destroy cell membranes, thereby, conducing to some form of cancer. Magnesium: Adequate amounts of magnesium present in the cashew helps keep high blood pressure, headaches, fatigue, muscle spasms and migraines at bay. Moreover, magnesium also controls the amounts of calcium infused in the nerves, thereby, ensuring smooth functioning of the nerves. Copper: Copper helps in energy and melanin production. Melanin is a pigment that imparts color to the skin and hair. It is also involved in the development of bone and connective tissue and also aids other physiological processes in the body. Cashews are tasty nuts with a delicate texture, providing a range of nutritional value, including vitamins and minerals. However, eating cashews may also trigger a variety of side effects. Consult your nutritionist or physician to determine if this nut is appropriate for your diet, particularly if you have allergies or headaches. 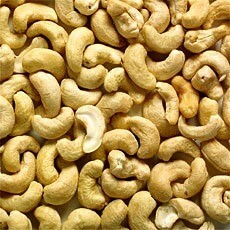 Weight Gain: Cashews are quite caloric and can be fattening. A 1-oz. serving of this nut contributes 163 calories and 13.1 g of fat to your diet. Keep your intake of cashews to a single ounce, and consumption should not trigger any negative health effects. However, consuming more than a single serving may introduce too many calories into your meal plan. While the fat from these nuts is primarily the healthier type of fat, even that may lead to weight gain if eaten in excess. Allergy: Nut allergies are a growing problem in the United States; a study in the December 2003 issue of the journal "Allergy" reports that one-third of children are allergic to pistachios, which may indicate an allergy to cashews, since they are in the same family. An additional study in the October 2005 edition of the "Archives in Disease in Childhood" notes that cashew allergies carry a higher risk of anaphylaxis than other nut allergies. This reaction can be fatal, so if your face and throat swell and you experience breathing problems after eating cashews, you need immediate emergency medical care. Other allergic reactions include hives, rashes, itching in the mouth and throat, vomiting, diarrhea and nausea. Blood Pressure: While cashews are naturally low in sodium -- only 5 mg per serving -- it is quite common to find commercially available varieties already salted. A serving of salted cashews can contain up to 181 mg of sodium. Eating cashews in moderation in a reduced-sodium meal plan is not likely to trigger hypertension, but consuming these nuts in large quantities can make the sodium add up fast. Keep your intake to under 1,500 mg of sodium per day to avoid spikes in your blood pressure. Headaches: If you suffer from headaches and migraines, avoid cashews. These nuts contain the amino acids tyramine and phenyethyamine, which help maintain normal blood pressure levels and provide a feeling of well-being, respectively. However, if you have a sensitivity to these amino acids, they can also cause head pain.